traditional gas grill and on a fuel-powered camp stove. Keep it interesting by mixing it up. Most of your meals can be cooked on all three methods! Due to the lightweight, unique needs of hikers and backpackers, this article focuses on car and non-primitive camping only. With car camping, weight and space isn’t an issue, so this list differs from those who participate in walk-in and primitive camping. Having your car parked at your campsite enables you to pack heavier items like cast iron skillets and bigger camp stoves—even a tailgating or full-sized grill—depending on your vehicle! Before you overpack, though, make sure you know the details of what is provided at your campsite. This will determine the amount of extra gear you’ll need to bring. For example, if picnic tables aren’t there, you’ll want to bring a folding table along with your camp chairs. Each state and national park is different in what facilities they offer. Some campsites will have full RV electric hookups and running water, while others won’t. If there is no running water at your campsite, you will want a few collapsible water bottles you can fill for washing and cleaning up. When space allows, a heavy-duty water cooler like ones used at construction sites and sporting events work very well. These are ideal for washing hands and dishes, as well as drinking water—it will even keep your water cold! A foldable camp kitchen keeps everything organized and tidy. 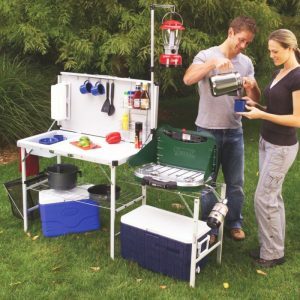 Coleman makes an incredibly handy and useful transportable camp kitchen which keeps your cooking space separate from your dining area and provides ample room and storage for all your camp cooking needs. With shelves and hooks, it keeps everything tidy and organized. There’s even a removable sink and paper towel holder! All successful camp cooks know the secret to their mastery is preplanning. Deciding on meals beforehand cuts down on prep and clean-up time. You can pre-cut and portion vegetables, sides, meats, sandwiches and snacks at home making it easy to grab and go as needed. There are a lot of camp cooking shortcuts you can research before going. Usually, apart from just a few specialty camping-specific items, you can easily get away with taking the cookware you already own. This helps save you a ton of money. Some camping gear is overpriced and nothing different than what you can purchase at the dollar store. Reusable plastic plates, bowls and utensils from a dollar or big box store will work just as well for a weekend camping trip as the more expensive brands’ gear will. Camp chefs are successful because they plan ahead—even simple meals. 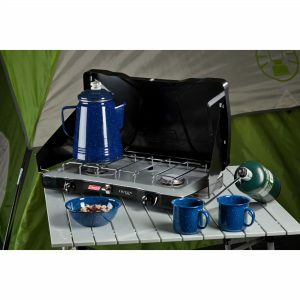 Setting up your camp kitchen is a top priority when planning and packing for your camping trip. Checklists are a great organizational tool that help make sure you don’t forget anything. Nothing is worse than realizing you forgot an essential item like a can opener or spatula after you’re all set to cook—trust us, we’ve been there! Coleman makes a sturdy, easy-to-use stove that will last years. This update on Coleman’s classic two-burner stove has room for one 12-inch and one 10-inch pan and features PerfectFlow technology which helps create an even heating area while conserving fuel. Wind block panels prevent your fire from going out in unexpected bad weather. These things are built to last and are durable, lightweight and easy to use. 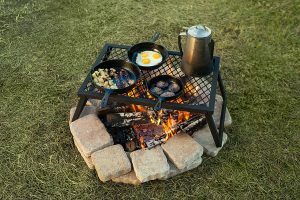 To get going quicker in the morning, use your camp stove to cook breakfast and make coffee instead of building a fire. It also comes in handy under a pop-up tent if it starts raining and your grill and campfire plan doesn’t work out. Don’t forget the fuel—two regular sized-canisters should be plenty of fuel to cook three meals for four people. Nothing tastes better in the wilderness than food cooked over an open flame! 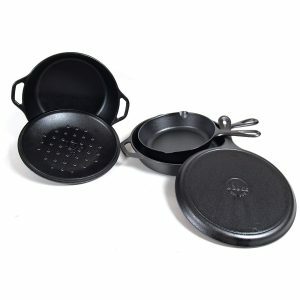 Use cast iron or cook directly on this Amazon Basics grill grate. Public grills aren’t necessarily the most sanitary. Don’t waste time trying to clean it with elaborate products, just bring your own grill grate! The extra-large 18-inch long AmazonBasics folding campfire grill is made to fit over the campfire and allows you to put flame-resistant pots and pans directly over a fire, as well as cook your food directly on top. It is important to note that if you cook this way you need open-fire resistant cookware—we’re partial to cast iron. Cast iron is the most versatile cookware. 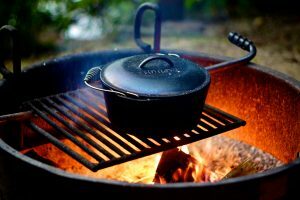 A cast iron skillet and Dutch oven might be all you need. They are ideal for an open fire, coals and the camp stove. Cast iron is more versatile than conventional pots and pans and in our opinion, make food taste better! You can even grill up dessert in a cast iron pan! Nothing beats a nice, hot cup of coffee in the mornings on your camp out. There are plenty of fancy camping coffee gadgets out there, but we prefer coffee the old-fashioned way. Sure, it may take a little bit longer to make, but you can’t beat the authentic taste. The Stansport enamel percolator set is super affordable costing less than $20. It includes an eight-cup percolator and four mugs. The hardened blue enamel finish doesn’t chip, or scratch and the handle is made so it doesn’t burn you. 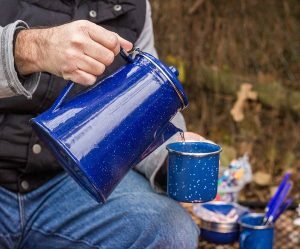 Put it directly on your camp stove and make a traditional pot of coffee or use it to simply boil water and make instant coffee, hot chocolate, tea or instant soup. 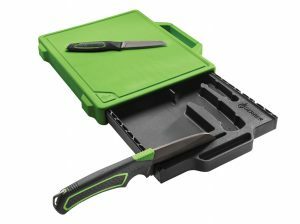 Gerber Freescape camp kitchen kit is compact, portable and includes two knives, a built-in sharpener and cutting board. There will be a lot of regret if you forget to pack a good knife! A cutting board may not seem essential, especially if you did most of the chopping at home, but you’ll be surprised at what can come up. The Gerber Freescape camp kitchen kit is compact, portable and includes two knives, a built-in sharpener and cutting board. It’s not camping without S’mores! 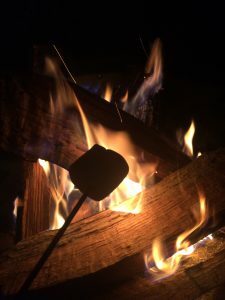 It is fun to find and carve your own roasting stick, but if you ain’t got time for all that, bring some made just for S’mores. These hand-crafted, wood-handled double-pronged sticks are safe, durable and well-made. They are 36 inches long and each hold either two hotdogs or two marshmallows. Cook the perfect dog and prepare the perfect S’more while remaining a safe three feet away from the fire. Camp cooking is fun and tasty! There’s no point in buying new cooking utensils for camping. Just take what you have from home—tongs, a spatula, wooden spoon and your barbecue set, and you’re good to go. 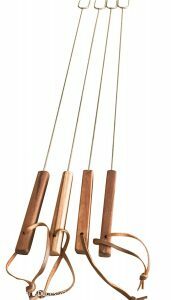 The only thing most of us don’t have is a cast iron oven lift hook, which comes in handy to stir and serve. If you don’t already own a stainless-steel mixing bowl set, purchasing a large one is useful when baking, as well as using it for washing dishes while camping. After cooking, wipe down all cooking and dining surfaces and pick up any food that has fallen on the ground. Don’t leave trash out and pack everything up at night to prevent critters from invading your campsite. 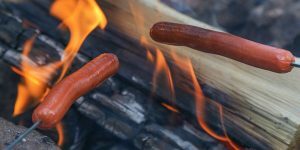 For ideas on what to cook while camping, see this article from our friends at 12 Survivors—CLICK HERE! What is your ultimate camp kitchen setup? Did we forget anything? Let us know by leaving a comment below.